Any basic LinkedIn search will get you a list of candidates, but how can you be sure your search is returning all of the best candidates to be found? A more methodical approach with Boolean search is more likely to lead you to the best and most qualified—rather than simply the ones who are easiest to find. And, according to sourcing guru Glen Cathey, that’s exactly how you can get ahead. The answer, of course, is how you use it. With that in mind, here are Glen’s most important tips and takeaways for turning LinkedIn searches into a competitive advantage that will help you track down the best—and most overlooked—candidate profiles. While professionals with a detailed list of their experience are easier to find on LinkedIn, those who haven’t had time to fully fill out their profiles shouldn’t be overlooked. Glen often finds great talent by messaging candidates with “text-poor” profiles—the ones who haven’t bothered to write lengthy, detailed summaries on LinkedIn. 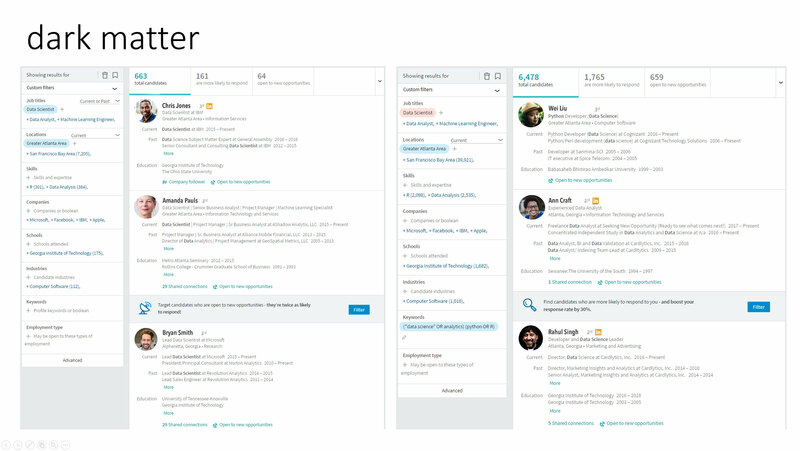 Best of all, these “ugly” profiles are overlooked by other recruiters, so you’re automatically more likely to get a response. Talented candidates have even been known to craft text-poor profiles on purpose because they don’t want to be bombarded with InMails from recruiters. These users found a clever way to stay out of the search spotlight—but as Glen points out, that just means you might be the only one messaging them once you expand your search. Many people only look at the first 10% or so of a search result—or the first few pages—assuming they’re seeing the cream of the crop. But recruiters tend to search for similar keywords and get similar results back, which means you’re probably looking at the same 10% of candidates as your competition. To gain an advantage, Glen recommends “starting from the bottom”—a Drake-inspired method for making sure you get deeper into search results and spot overlooked talent. Don’t be afraid to literally go straight to the bottom, skipping to the end of your results and moving backwards from there. For example, if you’re looking for a developer who has experience with Hadoop, you have to consider that they might not all use the title “developer”—and they may not mention “Hadoop” anywhere in their profiles, either. If you just search for those terms, Glen cautions, you’ll exclude lots of qualified candidates. Instead, use the Boolean OR operator to expand your results. Unlike the AND operator, the OR operator broadens your search because it only requires that one of multiple terms be included in each profile. Strategically multiple terms with both OR and AND operators can yield a much more targeted search. In the above example, when searching for a Hadoop developer, Glen connects several possible titles (e.g., software engineer, developer, and programmer) with OR statements in parentheses. Then he does the same with terms like Hadoop, HDFS, Hive, Yarn, and MapReduce—separating them by OR operators and bracketing them within parentheses. By combining the two lists with the AND operator, his search brings back people who have at least one term from each list in their profiles. 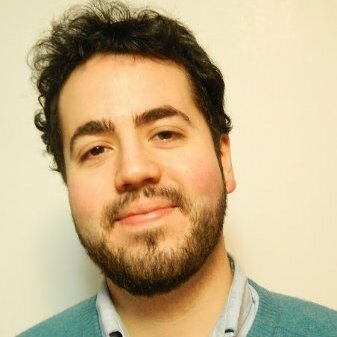 He’s essentially still searching for the same two concepts as the original query (“software engineer” AND Hadoop), but now he’s broadening the search with synonyms while still keeping it targeted. 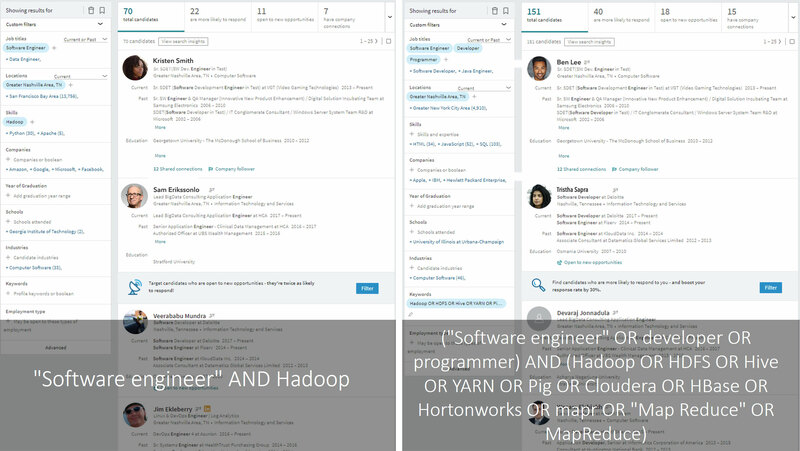 When you just search for "software engineer" AND Hadoop, you get 70 results, but when you expand that with synonyms using OR—while still connecting the two concepts with AND—you get more than double his results: 151 people, including 81 qualified candidates who were unintentionally excluded from the first result. This approach significantly increases your search results—and it can be applied to any job title, skill, word, or phrase that might show up in a qualified candidate’s profile. When you search for “data scientist,” you’ll get 600-some results. But there are tons of qualified data scientists out there who might not use that term. They will, however, use certain words like “data center" or “analytics” instead. When you exclude those 600 “data scientist” results by using the Boolean NOT operator, and instead search for terms that only a data scientist would use, you get over 6,000 results. That means you’re missing about 90% of data scientists with the first search, just because they’re not using that term. This is what Glen calls “dark matter.” You can find more candidates (who your competition is probably missing) by searching with dark matter terms. You can find these terms by working backwards. Start by searching for data scientists, then scour the profiles of a few of these candidates to determine what terms come up often. Then you can use the OR operator to feed those common terms—e.g., “data center”—back into your searches, ultimately revealing those hidden candidates who perfectly match your needs. You can make great use of the AND and OR operators in LinkedIn searches, but the NOT operator can be just as useful—particularly when you need to move through a long list of qualified candidates in a strategic, methodological way. With a method of strategic exclusion, you can make sure that each of your new searches exposes new, good candidates. In the above example, Glen was searching for a project manager who had experience with EMC technologies. He searched for all the people who used those terms in their profiles (“project manager” AND EMC), but quickly bottomed out the list. 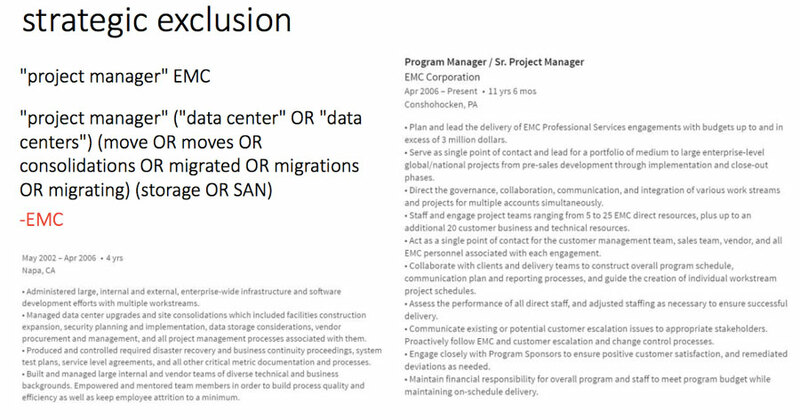 He then asked himself whether all qualified project managers would list EMC in their profiles—and because the answer was no, he chose to exclude that term in his next search with the NOT operator (or simply a “-” mark), while using his “dark matter” strategy to add several related terms (e.g., data centers, migrations, and storage). This brought back a completely new stack of candidates that was mutually exclusive from the previous results. Best of all, he tracked down a perfectly qualified candidate who simply didn’t think it was worth mentioning EMC in his profile. You’ll get a small group—let’s say four candidates—who match every single qualification. Now you’ll get a bigger stack of candidates—11, maybe—who have all but one of those qualifications. Most importantly, these 11 won’t overlap with the previous four candidates at all. You’ll get yet another new stack of very qualified candidates, who don’t overlap at all with your two previous searches. 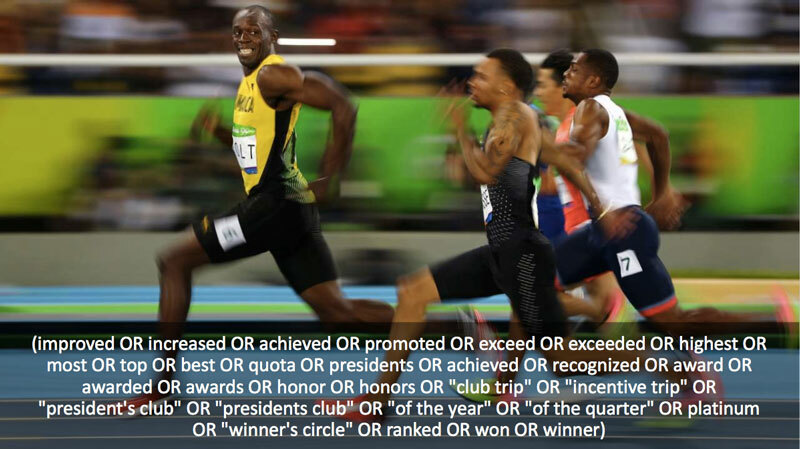 You can keep repeating this process for as long as necessary, continually building on your results in a systematic way. Imagine it like a series of concentric circles. In the dead center, you’ve got the small amount of candidates who meet every qualification—the five. The next circle contains the candidates who match all but one qualification, and so on. By using the NOT operator, you’re broadening your searches while making sure you don’t see repeat candidates. After you exhaust the center circle, you exclude it (with NOT) and search through the ring around it. You can repeat this process systematically, going ring-by-ring, instead of going through bigger, messier circles full of people you’ve already reached. Once you understand how to ask the right questions and turn them into Boolean searches, all kinds of new possibilities open up. For example, Glen often uses the OR operator to stash a ton of related terms into one search. He tinkers and experiments with the terms, always aiming to find a specific marker of the best talent. When looking for high performers, he started by asking himself what an exceptional candidate would have in their profile. They’d likely mention things like awards, achievements, honors, and making President’s club, so that’s exactly what he puts into his Boolean search, separating each word or phrase with the OR operator. Using this many terms may bring back thousands of results, but for Glen, who’s always looking for ways to uncover overlooked talent, that’s exactly the point. Once you have that big stack of results, you can use methods like strategic exclusion to winnow it down to the most qualified people. 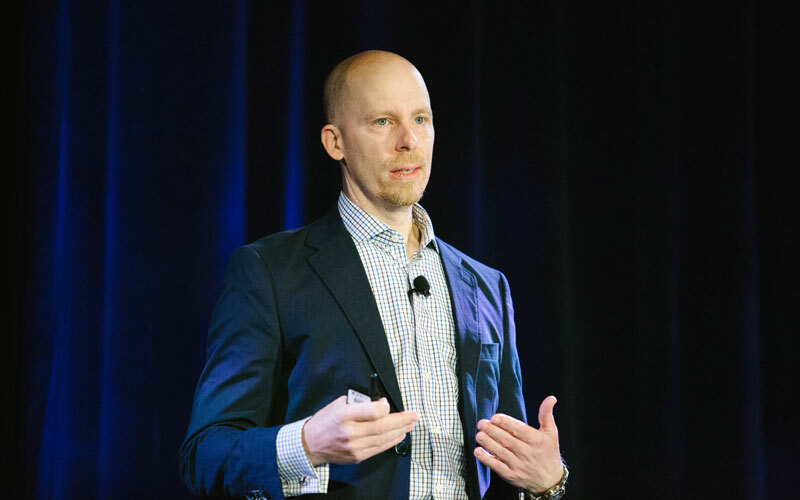 Recruiters who apply Glen Cathey’s simple but effective search strategies have experienced great results, but even this list doesn’t include all of Glen’s insights from his talk at Talent Connect. Stay tuned for our next post on Glen’s approach to candidate searches, including new tips on using Boolean search to find more diverse candidates. You can watch Glen's full presentation below and see his slide deck here.